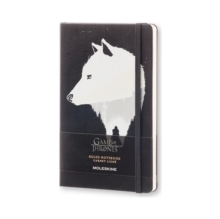 The Moleskine Game of Thrones Limited Edition Notebook. This large, ruled notebook has a hard cover with Game of Thrones-themed graphics, as well as themed endpapers and a themed postcard. The 240 ruled pages are made from acid-free, ivory coloured paper. The notebook includes an expandable inner pocket for loose notes and cards.